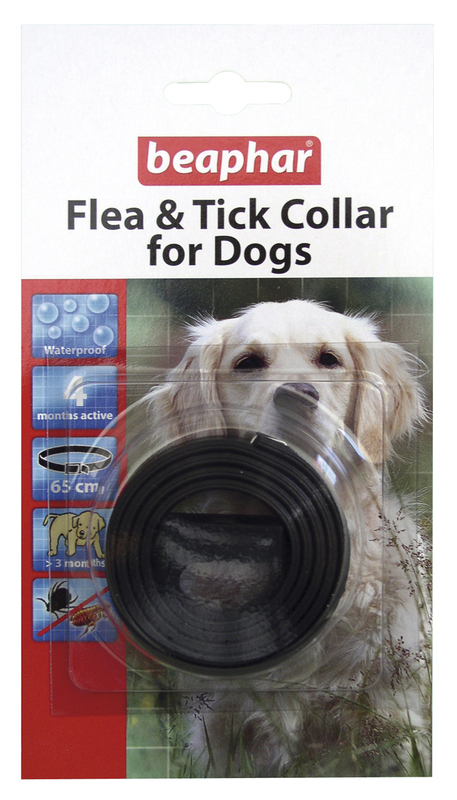 The Beaphar Plastic Flea & Tick Collar is a water resistant collar which kills ticks and fleas and prevents them from returning for up to 4 months. The collar starts working immediately but can take several days for the active ingredient to spread all over the dog's coat. The reflective collar makes your dog more visible in low light. Colours are randomly allocated. Suitable for dogs over 3 months of age. Active Ingredient: Each collar contains 15% w/w dimpylate (3.6 g dimpylate per collar). Simply slide the free end through the buckle, and tighten to give a comfortable fit. Cut off any excess collar with scissors and throw it away with your domestic rubbish. Below are some recent questions we've received regarding Beaphar Plastic Flea & Tick Collar for Dogs, including answers from our team. Hi I have been using this product on my dogs but they still have fleas. I need to use a spot on treatment but need to know how long is required between removing the collar and starting a new product? You can apply a spot-on at any time. The collar contains the active ingredient dimpylate, which is not the same active ingredient found in spot-ons, so you can use the two together. These products have very different active ingredients and it should be safe and effective to do as you suggest, though ticks are particularly difficult to control, whatever you use.